Praiano has a little bit of everything - put it all together and you get a whole lot of wonderful! It might be small but you can spend a good while here and not get bored. You've got beaches, stunning walks and a town of higgledy-piggledy houses, where the flowers seem to have escaped from the window boxes and be growing in, on and around everything in sight. If you'd like to spend a little while in Praiano (who wouldn't) then the Hotel Pellegrino is where I'd recommend you stay. Luigi (the owner) and his family are the archetype warm friendly southern Italian family and they'll have you feeling like you've come “home”. I can bet you'll not be keen to leave either. Nearly forgot, the meals they cook for dinner are out of this world and they have a free shuttle to the beach. This is the main beach and it is packed every morning throughout the summer. In the afternoon things quiten down, as the sun dips behind the cliffs, but that's only until evening time when the nightlife begins at the famous Discoteca Africana – an institution that has been THE spot to dance the night away since the sixties. The beach is easy to get to with parking nearby and all the coastal buses stop here. Not quite as easy to get to and very small but the views as you walk down the hundred of steps to the beach make up for that. Not sure if they make up for the fact that you'll have to climb back up again later. If you arrive by car you'll need to park in Praiano and walk or you can get a boat shuttle from Marina di Praia if you prefer, but to be honest (apart from the walk and views) the beach itself is not great. Most people sunbathe on two big concrete blocks which the owner of the beach has put in to increase space, in my view they are horrible eyesores. Now this to me is the beach to visit – it is amazing! Like a secret hideaway from the world in a setting out of the brochures of paradise. There aren't any facilities here, just beach, blue sea and cliffs of pine trees behind. Only way to get here? You can hire one from amalfiboatrental.com or, if you are more adventurous, you could even hire a kayak from Windsurf Praiano. The Sentiero degli Dei (Path of the Gods) is spectacular. It isn't easy for older folk like me but my teenage son reckoned it wasn't too bad at all. The worst bit is the climb up the steps to the path from Praiano. By the time I got to the path I was pretty much done for the day... until I realized I hadn't even started the walk and the 6 kilometers of the walk itself still lay ahead. Still, it is amazing what a bottle of water and some stirring words from my son can do to get an old fella moving again. I was glad I didn't give up. The views along the walk are breathtaking and, although it took me nearly five hours in total to get from Praiano to the end of the walk in Nocelle, it is an experience I'll never forget. You can probably do it in a hour or two less but I loved the time I spent chatting with people I met along the way. That and the frequent stops to enjoy the scenery (my son reckons more to catch my breath) made it take longer. Some people walk the other way - starting in Nocelle - but my advice is don't. Why? Well because the best scenery will always be behind you doing it that way. You'll miss that experience of coming around a bend in the path and getting that WOW! experience. 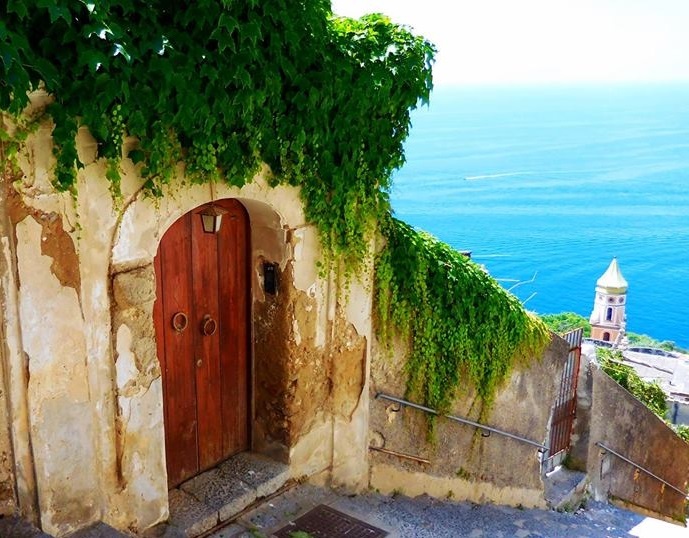 For more on this an other walks on the Amalfi Coast there's a great book you should get before you leave called the Sorrento-Amalfi-Capri-Landscapes Series. If you aren't on a tight budget a good idea is to do the walk with a guide. They point out so many things that you'd miss on your own. This is one guided walk that comes highly recommended. There are a lot of churches for such a small town (around eight including chapels) and there's an old watch-tower as well. The three churches you really must see though are the Church of San Gennaro, the Church of San Luca Evangelista and the Church of San Giovanni Battista. Most people arrive here by car which really is the best way. You can get a private transfer from Rome or Naples (here's one from Rome) and then explore the coast by bus but I'd really suggest you have your own car.